Lately, my kids have taken to ‘helping’ more in the kitchen. I attribute this to binge-watching the entire season of Master Chef Junior on Hulu during a rare rainy Arizona Sunday afternoon. I love hearing them talk about the contestants, how amazing the cupcake creations look, and that they, themselves, ‘love salmon and would have no problem lifting and butchering a fresh 20 lb Sockeye’ on their own. Both statements are false, but who am I to squash a dream? And, I just can’t deny that it melted my heart to hear my three year old ask for his own ‘sharp food cutting knives’ for Christmas. Because of this, I’ve been coming up with more simple, kid-friendly, make-at-home versions of our favorite restaurant foods to keep them excited about cooking. 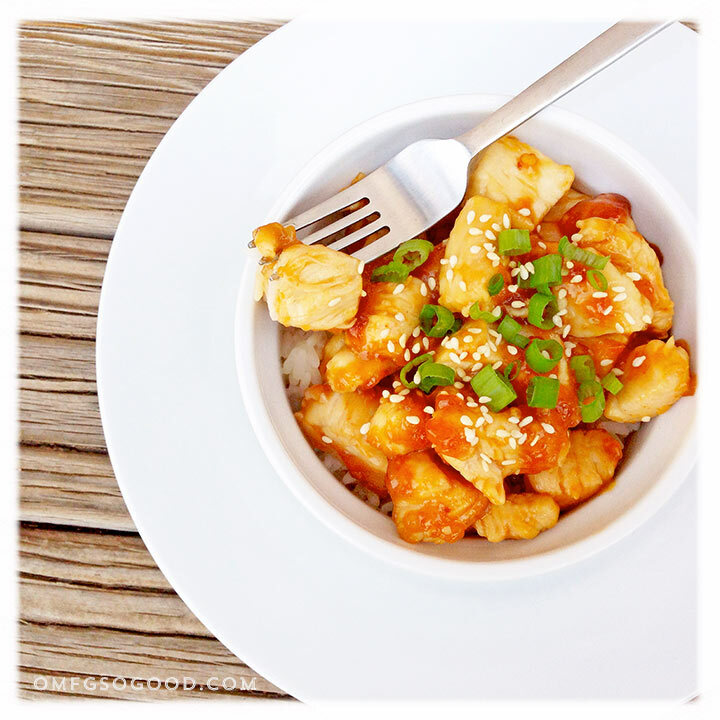 One of our favorite take-out treats is Orange Chicken. It’s got a perfect blend of sweet and subtle spice that appeals to every tastebud under our roof, and it’s super simple to make at home. Win. Win. I opted to kick our version up by using Cara Cara oranges, which are only in season between December and April. If you’ve never tried one, you’re missing out. These oranges are seedless and juicy, with a beautiful pinkish orange pulp. Their taste is sweet and tangy, reminiscent of raspberries or strawberries. So. Stinkin. Good. Combine that flavor with a hit of chili garlic sauce, and you’ve got a hands-down winner, chums. To make the sauce, whisk together all of the sauce ingredients in a small bowl and set aside. Heat the oil in a large skillet (or wok if you have one) over medium-high heat, and add the minced garlic. Cook until it’s just fragrant, then add the cubed chicken and toss to cook until the chicken is just cooked through. Pour the orange sauce over the cooked chicken and toss to evenly coat. Cook for a few more minutes to thicken and heat the sauce. Add salt to taste. To serve, garnish with sliced green onion and sesame seeds. Serve over steamed rice. Mouthwatering orange chicken, i can’t wait any more. Going try to make it and then tell how its cook.